Support needed for Sr. Megan, Michael and Greg – please donate! NOT WAITING TO BE ASKED . . .
Three peacemakers are in prison. 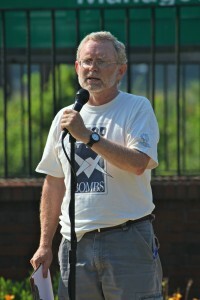 Donations can be made through Nukewatch www.nukewatchinfo.org by scrolling down to the Donate button. After entering a Paypal account or credit card number, proceed to the review page, click a link, and indicate that the donation is for TNP. OR, mail a check, TNP on the memo line, to: Catholic Worker, PO Box 29179, Washington, DC 20017. In a highly political case, a Japanese anti-nuclear activist faces criminal prosecution over a Tweet she sent in July. Mari Takenouchi is the founder of Save Kids Japan and a free-lance English-bilingual journalist publishing at savekidsjapan.blogspot.jp. 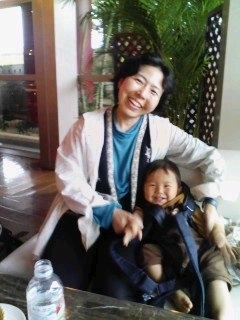 She advocates that mothers and children, who are most sensitive to radiation exposure, be supported and relocated outside of the contaminated zones around the Fukushima Daiichi nuclear power site. She tweeted a pair of quotes dismissive of radiation concerns – one from the CIA-funded father of Japan’s nuclear industry, Mr. Yasuhiro Nakasone, and the second from Ms. Ryoko Ando, director of the Fukushima ETHOS project — prefacing them with the words, “Common points of the 2 criminals of the century”. I was stunned that 8 months had elapsed with apparently no prior conversations, out of court, between the opposing sides and the court in this case, and would have imagined it had been resolved by negotiation during those delays, and relegated to where it deserved to be disposed. – unworthy of evidence in any court of law. 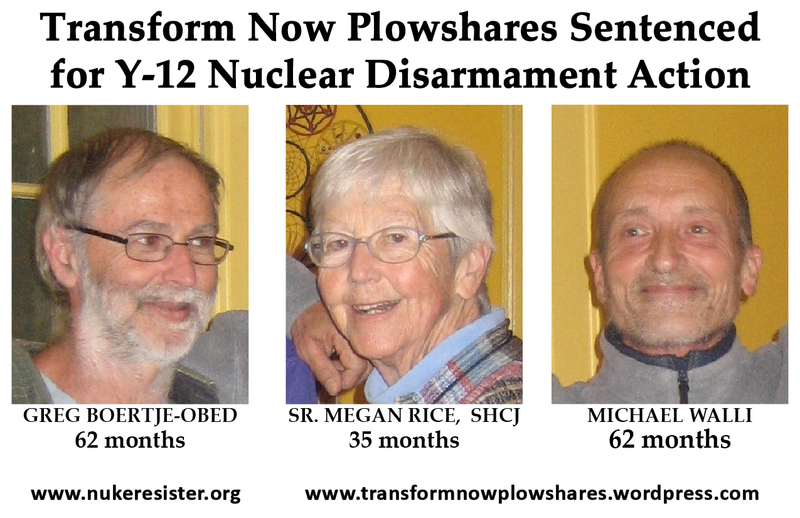 Nine months after their conviction on charges of sabotage and criminal damage at the Y-12 nuclear weapons plant at Oak Ridge, Tennessee, three nuclear abolitionists were sentenced to lengthy prison terms today, February 18, in federal court in Knoxville, Tennessee. 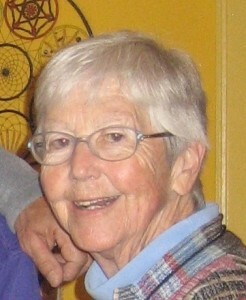 Federal Court Judge Amul Thapar imposed prison terms less than what federal guidelines recommend and prosecutors asked for: 35 months for Sr. Megan Rice (84 years old), and 62 months for Michael Walli (64 years old) and Greg Boertje-Obed (59 years old), followed by 3 years of supervised release. 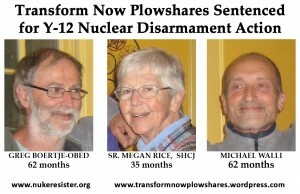 Divided among them, the three Transform Now Plowshares activists must also pay restitution totaling $52,953. 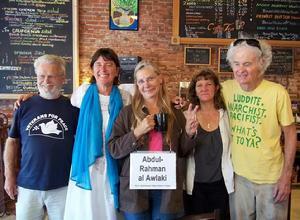 The “Wheatland 4” were arrested in April last year, while protesting drone warfare at Beale Air Force Base. They were found guilty of trespassing after a day-long trial in a Sacramento Federal Court on Monday, February 3. 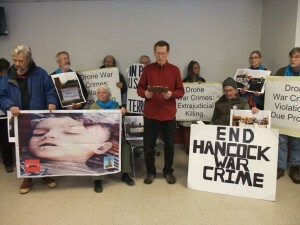 On Friday, February 7, Town of DeWitt Court Judge David Gideon found twelve of the Hancock Drone War Crimes Resisters guilty of disorderly conduct, but acquitted them of trespassing.They had gone to Hancock Air National Guard Base near Syracuse, NY on October 25, 2012, to bring a Citizens War Crimes Indictment to the base and symbolically block the gates. Their nonviolent action had called for an end to drone warfare.